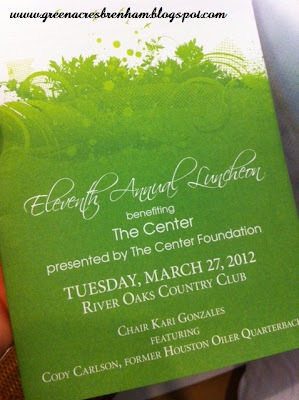 Last week I was invited to attend The Center 11th Annual Luncheon at the River Oaks Country Club featuring Cody Carlson, former Houston Oiler Quarterback (my husband was jealous). The Center is a private not-for-profit agency that provides residential, vocational and day services for more than 700 persons with developmental disabilities and other related conditions. 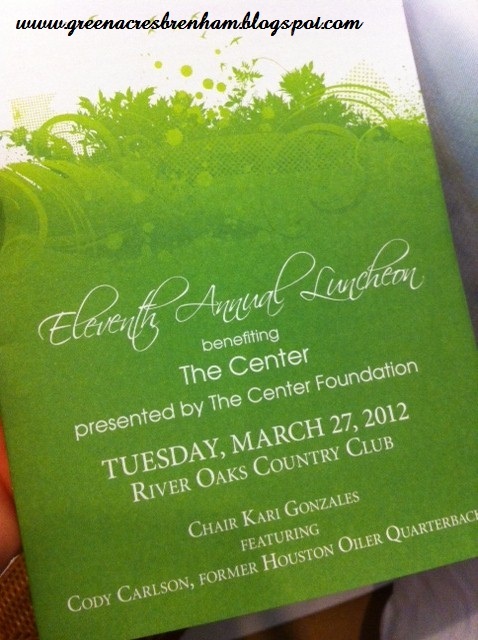 During the luncheon raffle tickets were available, and the raffle items I must admit were lovely! To mention a few; Black Patent Leather Valentino Handbag, Valentino iPad Cover, Gucci Men's Silk Tie Collection, and other knockout items. Thanks to Nicole for the invitation and the great time.